Friendly, chatty – is this the real Alex Ferguson? Atlanta (CNN) - "Good interview." Alex Ferguson shakes my hand. "Good interview, son," he says again, patting me on the back. 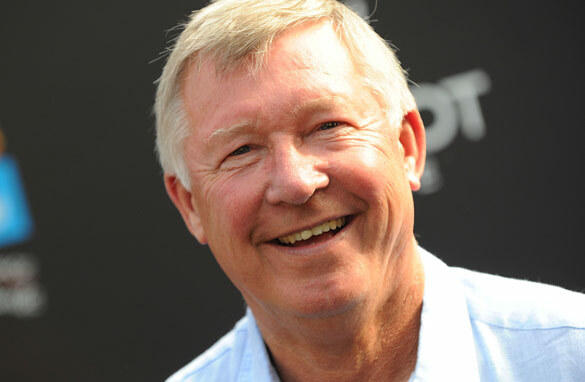 Alex Ferguson is my dad! Could that be the same Alex Ferguson who can freeze a journalist at a hundred paces with his curt replies and icy stare? The same man whose infamous "hairdryer" blasts of discontent can turn superstar footballers into quivering schoolboys? The same Alex Ferguson who signaled the end of David Beckham's Manchester United career with a much-publicized kick of a boot that gave Becks an eyebrow parting that certainly wasn't a fashion statement? I mean, let's be honest, if you think of Alex Ferguson, what image comes to mind? For most it's a red-faced, no-nonsense Scot, who rails against referees, rival managers and the football authorities with impunity. What is he rebelling against? What have you got? As a result, it should come as no surprise that I, like many before me, approached my interview with the 68-year-old with a bit of trepidation. Yes, he's the most successful manager in the history of English football, an icon of the game, and he manages arguably the most famous club in the world, so clearly anyone who loves football, as I do, should jump at the chance to talk with him. But there is the flipside, in that his image is just a bit scary. Will he be in a good mood? Will he find my questions stupid? Worse still, will they be irritating? And, if so, will there be any flying boots that I might have to avoid? All right, the latter is an exaggeration as the interview in Philadelphia during United's pre-season tour of the U.S. was set for a hotel, not a changing room, but you get my drift. However, I soon discovered that the Fergie we think we know (you see we're on nickname terms now), is not the "Mr. Angry" caricature he's often made out to be. "How do you stay motivated after 24 years at Old Trafford?" I asked. He gave me a full, well-trodden answer. "You didn't win much last year. Is this a transitional period for United with so many players on or above the cusp of 30?" He started to veer off script and expand. "Does United have the time and patience to let home-grown youngsters bed down in the first team when the likes of Chelsea and Manchester City are able to plug any shortcomings by paying gazillions for ready-made superstars?" He was into his stride now and as expansive and friendly as your favorite uncle. Well, a favorite uncle who just happens to be the driving force behind a global franchise. It was Fergie unplugged. Open, ebullient, insightful - heck, he even turned raconteur at one point, regaling me with a story about how his wife got him to abandon his scheduled retirement in 2002 because she wanted to keep him out of the house. It was great, and by the end of our meeting it felt more like we'd been having a good old chat than a question and answer session, and clearly the feeling was mutual. So why am I telling you this, other than to name drop? Well, it's just that nowadays we so often seem to paint our celebrities as one thing or the other. Tiger was all good, now he's all bad. Roger Federer's a nice guy. Serena Williams is feisty. Lebron James, if you're from Cleveland, is an ungrateful, disloyal mercenary... etc. etc. But the fact is that most of the time we're only getting the two-dimensional view of our heroes. We don't know them, we just think we know them from what we've read, what we've heard, and what we've seen. And often the reality is quite different, or at least a grayer version of the preconception. Okay, Ferguson was on a pre-season tour - no pressure, no issues, so therefore no problem. He could afford to be relaxed, and he was, even telling me before the interview that I didn't need to call him "Sir Alex," despite him being a knight of the realm. But I'd like to think that it was more than just the laidback atmosphere. Perhaps in the absence of any external forces, I got a glimpse of the real Alex Ferguson. A man who's occupied one of the toughest jobs in sport for 24 years, yet about whom no-one who's been close to him, not even Becks, has a bad word to utter. "You should never meet your heroes," so the saying goes. But, on this occasion, I'm very glad I did. so where is the interview? Where's the actual interview then? How can we read the actual interview? I'm more interested in what Ferguson says about the youth system, transfers and the upcoming season than about the author's impressions of Ferguson. I Work at a leading newspaper in Mexico and had the opportunity to meet him in Cannes in 2007, I would like to send you a picture of me with Alex Ferguson that will amaze you and back you up on the amazing guy he is. Can I have an Email because I can´t find it. I am envious. Alex Ferguson is a legend. I always thought he was more of a no-nonsense disciplinarian than just an out-and-out cold human as some media outlets portray him. I've watched him at training sessions laughing with his boys and cracking jokes. Hope you can share his response to your questions. Good to hear someone say something positive about a famous figure rather than taking the easy way out and going for the negative cliche. And for those who are moaning about not reading the interview, have some sense, the piece was supposed to make you WATCH the interview on CNN! You can find it online though, just dig around on this website and find it like I did. Show some initiative, it works wonders you know. I enjoyed your article,Terry. As you imply, the media is voracious in it's quest to report anything negative about our heroes. Great to have a journalist fair-minded and willing to look for the best in someone. I had white lecturers in my days in the university. I listen a lot to Skynews, CNN, Aljazera. But I want to make a confession; I heardly understand Sir Alex any time he grants interviews. I have tried alot to no avail may be because he is a Scot. His accent is too strong for my understanding. One hears and understands other Managers in the EPL without difficulty. But this Sir Alex, no way! Fantastiiiiicccc! He is perfect for Manchester United!!! He can be very strict but when i met him he was very nice!!! cant deny i was a little it scared! ". "Good interview, son," he says again, patting me on the back. Alex Ferguson is my dad!" all i care for is the interview, he is a man i like so much and i want to know is background,pls terry. Nice article mate; a refreshing change from the norm. I've watched Sir Alex over the years many times and you can see there is a genuinely warm person in there; but given the pressure of that job, inevitably he has to have a tough side too. this wasnt an interview but rather blowing one's own horn. Where's the interview, please? What you wrote was more akin to an Alex Ferguson biography. We know what he has done over time, results speak for themselves, but after 24 years as a coach for MU I would think its time to call it a day, inject some fresh blood, new ideas and new philosophies. I would be much more interested to know what the future has in store for MU rather than this chest-beating. THIS IS NOT A WORLD SPORTS, YOUR REPORTERS SHOULD CHECK EVERY CONTINENT FOR REAL SPORTS AND REPORT THEM, NOT SEATING DOWN IN THAT AIR CONDITIONED OFFICE. MOVE OUT, SEARCH THE NET FOR SPORTS AND MAKE IT WORLD. Good article and to read about the 'real' person outside of the pressure of the EPL. hi terry i really enjoyed your article this will the Press in the UK that he is better than what they ought to portray about him. I think he is the best manager in history and as for us Manchester United fans we are here because of him . Who cares if Alex is your dad! Sir Alex is what The Undertaker is to the WWE. He is simply The Phenom. People hate him simply because he's unstoppable, ppl like him come every century..cheers Sir! SAF is a class act and his record speaks for itself so those who are struggling with the difficult scottish accent should just stick to reading the trophy record he has notched up over the last few decades in charge. It just goes to show what a great manager he is and how important it is to let managers build great teams over time.